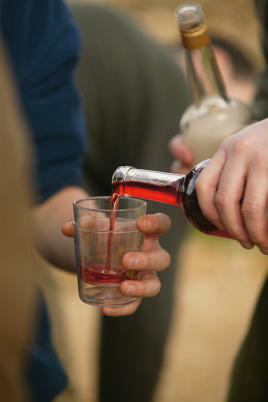 Sloe gin has become the traditional shooter’s tipple. To my mind there’s nothing better than a flask of home-made sloe gin to refresh yourself and those who share your sport. I don’t care for ready-made sloe gins as they are too sweet for me. This year is showing a bumper crop, and the hedgerows round our way look like they are festooned with clumps of musket balls. With Nature’s bounty so close at hand, I thought it high time to make my own sloe gin for a change, rather than guzzling the efforts of my pals. The only downside to this otherwise laudable aim is that my sloe gin would not be ready for November, when I have my first shooting day. So, I set about some developmental work to produce sloe gin that was drinkable in a fortnight and excellent after a month. Sloe gin is simply a tincture that relies on alcohol to extract the flavour and colour of the sloes. Traditionally, each sloe is painstakingly (and in most cases painfully) pricked before being immersed in gin. It’s a long process. I know some folk freeze the sloes to break them down to allow the alcohol to penetrate more speedily, but I’ve tried this and the results were not up to scratch. I was inspired to develop my own process after I saw the wonderful ruby red colour of the juices oozing through the crust of a damson crumble. They formed a syrup which held the colour and flavour of the fruit to perfection. I reasoned that if a similar approach was taken with sloes, then sloe gin could be made in days rather than months. I was right, and in the spirit of public benefaction, I wish to share this novel process with my fellow sporting ladies and gentlemen. Discard any imperfect sloes and remove any leaves or stalks. Wash the sloes well. Place in an ovenproof dish and dust well with most of the caster sugar. Save 75g of sugar to adjust the sweetness later. Sloes are tart, but don’t overpower their fruity flavour with too much sugar. Bake in a low oven for about 20 minutes. You may need to add a teaspoon of water to get the syrup to form. As the fruit starts to break down, give it a stir to release the red syrup. When the fruit is a complete mush, take it out of the oven and allow it to cool. When cooled, you can adjust the sugar to taste. Spoon the stewed fruit into a sieve and force the skins and pulp through the mesh using a wooden spoon. This isolates the stones, which can then be thrown away. Put the pulp and syrup into a large jar. Rinse out the oven dish and then sieve the last bits of the fruit with some of the gin to make sure that none of the fruit mixture is wasted. Top up the jar with the rest of the gin and leave to cool. After 72 hours test the brew for sweetness and add more sugar if you think it needs it. (Sugar is best added in the form of a syrup.) You may want to add a couple of drops of almond essence. I find this gives the drink a slightly nutty taste. Buy the best almond essence you can and avoid the synthetic stuff, which is normally called almond flavouring. After a week I add about 75ml of 79.9 per cent Polish pure spirit vodka. Most gins are only 37.5 per cent by volume and I find them rather thin. The Polish firewater supercharges the mixture and gives it body. It’s flavourless and designed as a base for cocktails. You can buy this rocket fuel on the Internet. After a fortnight, the sloe gin is ready to drink. This method is certainly applicable to damson gin and may well work for cherry brandy or vodka, though further research is needed. Lives in the North East of England, interests include fieldsports, shooting and trapping.